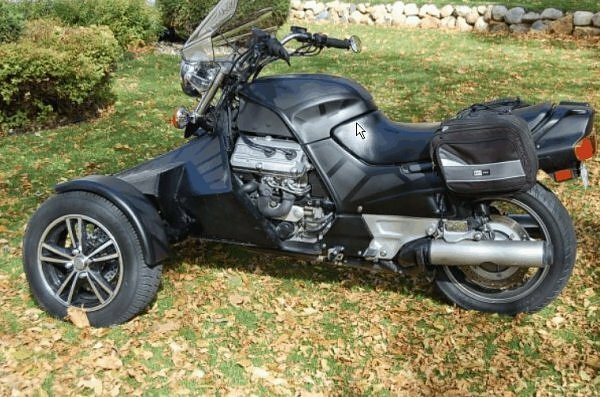 This article is a collection of many threads posted on different motorcycle forums. 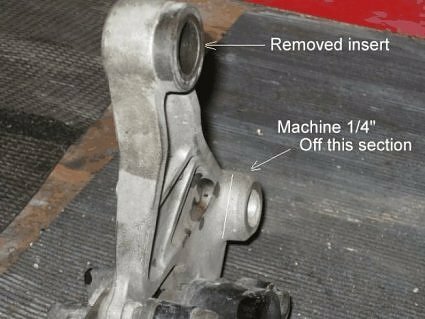 It is NOT to be considered a "how-to or step-by-step" procedure for converting your ST1100 w\o ABS to use a Car Tire on the rear. 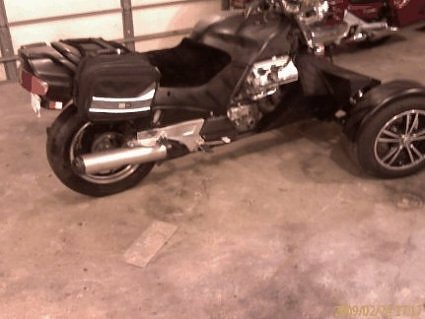 This is the 1995 ST1100 I converted to a STealth11 reverse trike. 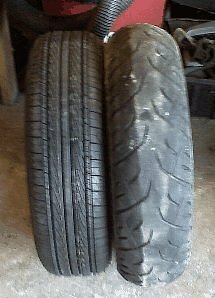 While it has a pair of Automobile steel belted radials on the front I was stuck with a standard motorcycle tire on the rear as the ST1100 has a 17" rim and no usable car tire is available for this size rim. 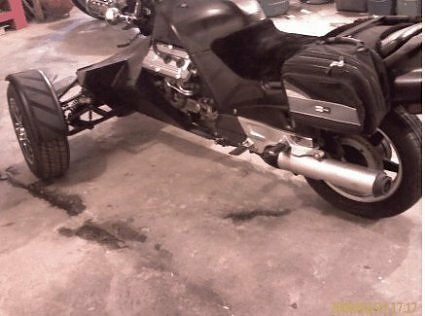 The fix was to remove the rear wheel and fit a Goldwing GL1500 rear rim to the bike. Honda is a smart company so most Honda parts are interchangeable between model classes. 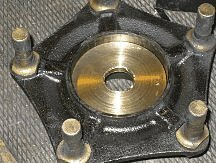 The drive spar for most shaft drive Honda motorcycle interchange. So do the brake rotors and calipers. My goal was to find a 16" rim so I could use a 175x60 rear CT in lieu of the MC tires which are not suited well to this particular application. 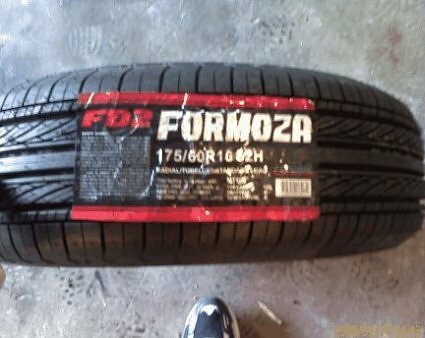 These tires are available for the modest price of $73 and will last 35k or more vs the 6k I could expect from a $150 MC tire. As usual Sport Wheels in near by Shakopee MN had several candidates on hand so I picked up a GL1500rim which fit perfectly with just a couple adjustments. First as I figured the drive side fit perfect, the entire assembly is 1" narrower than the stock ST unit so I made a 1" axle spacer out of a piece of standard water pipe, with this everything dropped into place for viewing. 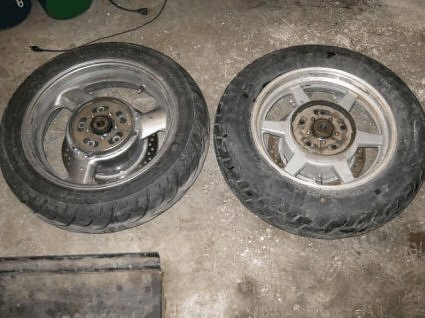 Here are the two wheels - ST 17" on the left and GL1500 16" on the right. 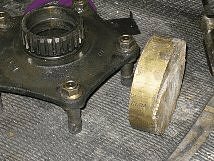 As you can see the drive side is identical along with the bearings etc. perfect fit along with the brake rotor. View of the GL wheel mounted. Here again the wheel fits nicely and required now modification at this point. 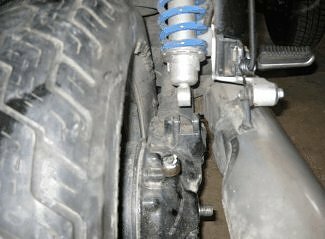 Modification for Car Tire use. If this was a standard ST1100 and I just wished to go to a different rim I would be done however for a CT to fit in the swing arm I needed to shift the wheel slightly to the left so the new tire would clear the drive shaft tube. For this a very minor modification was needed. 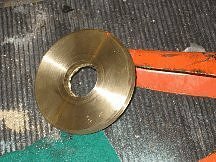 First I grabbed a piece of brass I had laying around and chucked it in the lathe to create a 1/4" thick spacer. Once down to the proper diameter I also added a raised portion to compensate for the stock spacer that is part of the drive assembly. 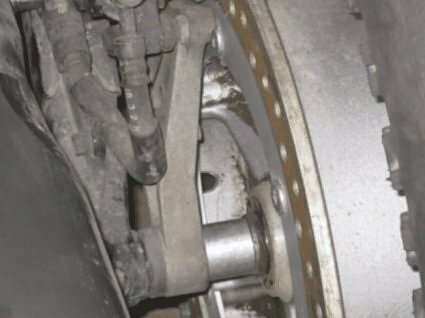 to the drive axle and the outer part with the drive hub rotate with the wheel. Here it is all assembled and the brass spacer has been cut into two pieces. Now that the wheel has been shifted 1/4" to the left I also needed to modify the left side to allow proper alignment of the brake assembly. 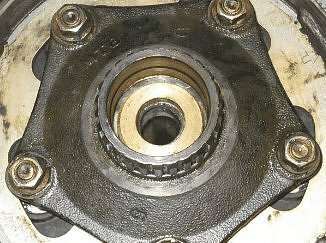 The hard steel axle bushing insert was remove and the locking nub reduced by 1/4" on the milling machine. The original caliper once modified fits fine and the rotor here is the GL rotor which is identical to the ST rotor. helps with the ST high gearing so take off and cruising is set to a more comfortable power band. Also take note of the very narrow wear pattern on the MC tire - this tire is near shot and has less than 3,000 miles on it. 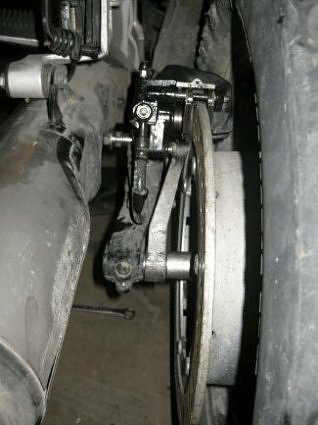 It would not have made 5000.
as the tire clears the swingarm by the predicted 1/4" and as with most CT installs, start to finish was less than 15 minutes. I did paint the wheel black and polished out the flanges so it fits in with the front mag wheels. Test ride was a total success as the pull away from a dead stop was better than ever and the ride was no longer harsh as with the harder MC tire - pressure on the front tires is 12.5psi and the rear is set to 25 psi - tire footprint is perfect at this rate. 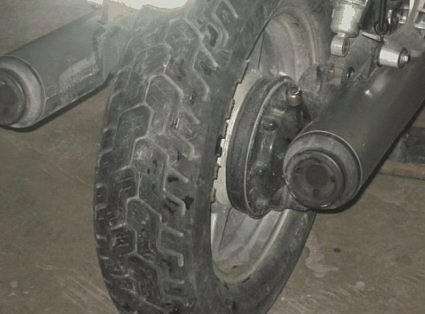 If this was a standard two wheeler I would use the same pressure on the rear as any higher would detract from the axle to surface geometry during cornering.